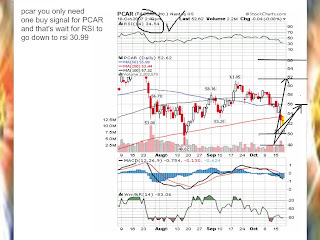 PCAR, NOT SUCH A clear buy signal, but it's a hot company....price is struggling a bit since the 2 for one split, which i s normal activity. 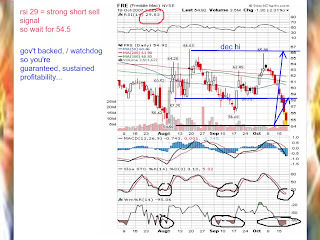 FRE is a perfect falling knife, at 54.5 = two bottom , looks like the right entry price..
NOV 135 call NMX is sure active...2.20 at 123 , 2.90 at 126..
What do u think of beanie's pick STV, zee? 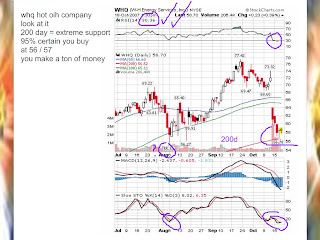 Hmm, beanie's long term picks are much better than his changing short term daytrade directions. 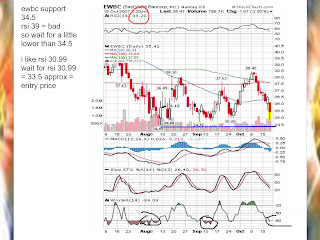 Beanie is still extremely bearish (check his new post), I find his sentiment without much merits at this point, but I think he's just going with his gut feelings. There's no way the market will crash with all these good earnings. With Cat's dismal outlook, I wouldn't expect much from PCAR. At one time they used Cat engines almost exclusively. I don't know about now. How did beanie know we were going to fall today? A gambler's intuition?